You cannot add "Tom Blackshear Classical Guitar #223 Spruce EIRW" to the cart because the product is out of stock. Manuel Adalid Anniversario Classical Guitar #89 Cedar – Elevated Fingerboard – Gorgeous – Major Discount! Weight 4 lbs & 6 oz. The Anniversario guitar is mighty special, on a class with the powerhouses of this generation. Celebrating 50 years of building from 1957, Manuel has built select few of these guitars, this particular Cedar Double Top being #71. Double Top with Nomex, utilizing the ultimate in Manuel’s experimental tech, this guitar really tells you something immediately. First, I played her softly. Nice. As I played I became more aggressive, where the guitar handled the volume increase magnificently. Voicing was even and balanced, separation and clarity exceptional. Warm yet vibrant. By the time I was done, I was smiling, saying, ‘whooo’, which is always a good thing. The Madagascar Rosewood is a wonder to behold, being of dark red, rich ruddiness, streaked with deep chocolate browns. Manuel uses nothing but his best stock of old seasoned woods to create his singular creations of this level. The headstock is magnificent, mindful of top notch German aesthetic. 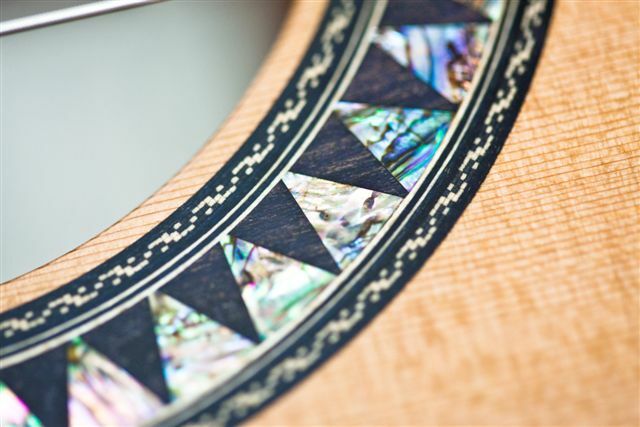 The Mother of Pearl highlights in the Rosette is simply deadly beautiful. MP3 Audio – 190209-Adalid 50th Anniversario #89 Cedar Madagascar – this guitar is set up by me personally, and it worked very nicely. The guitar is a boat load of fun to play, fast and articulate. The trebles are coloring nicely, the mids are growling and the basses are deep but not overwhelming. Priced at under $1500 off or her normal $7500 this guitar has to be given due consideration.